I got a stellaris LM4F120 launchPad hanging around for sometime. I haven’t done much with that other than trying FreeRTOS on it. Recently I got a cheap L3G4200D from ebay. I read the raw values(XYZ axis angular rate) from it via I2C using the stellaris. I haven’t yet figured out how to convert it to real angles. In second part I will create a 3D WPF app to display a 3D axis view. Sensor module i got from ebay have L3G4200D,ADXL345,HMC5883L,BMP085 sensors and its cheap. 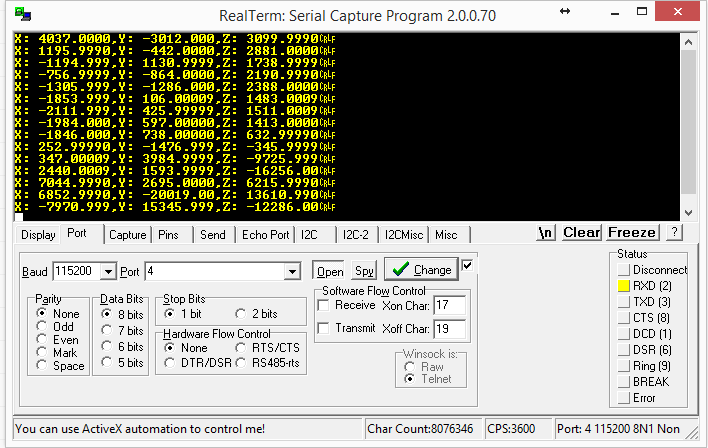 Value is send to the PC using UART0 which is connected to the stellaris virtual port which will appear on PC.